Something that I have often wondered about these right-wing bloviators is if they might be totally the opposite of their on-air personna… that it’s all a show because, you know, what would corporate media have to gain if there weren’t controversial radio shows creating all this attention. I don’t think that scenario is likely, but sometimes I wonder. As for him feeling inadequate… not a chance. He has millions of dollars worth of padding from the real world. Anything he can buy—whether or human or inanimate—to occupy his off-air moments, he surely does. As far as he’s concerned, he is the perfect man. He knows all there is to know and all of his opinions are facts, just spelled differently. What makes him strong, of course, are the legions of non-thinking, non-caring, selfish, bigoted people who listen to his show and feel further validated because of his rubbish. Obviously, he has an audience for what he does, but instead of using his ability to actually affect positive change with thoughtful consideration of issues, he helps to maintain the grip that corporations have on us by pushing as “common sense” things which are ultimately against his audience’s best interest. Corporate America (and certainly Limbaugh) benefits when so much of the nation is caught up in this McCoys vs. Hatfields-type feud. 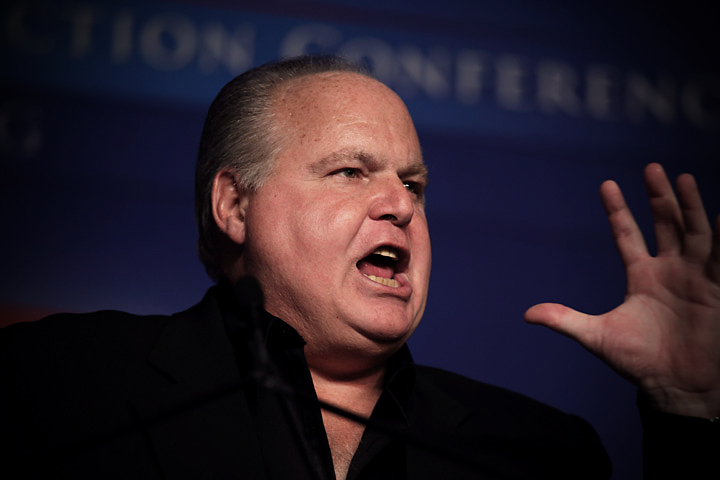 As Bill Maher so astutely pointed out last night, Rush Limbaugh has been married four times and has no children. He IS birth control.